There is lots of weird stuff in this world, and we’re sure you want to know all about it! Have you ever tried to know smallest things in the World if you are then this is only for you. 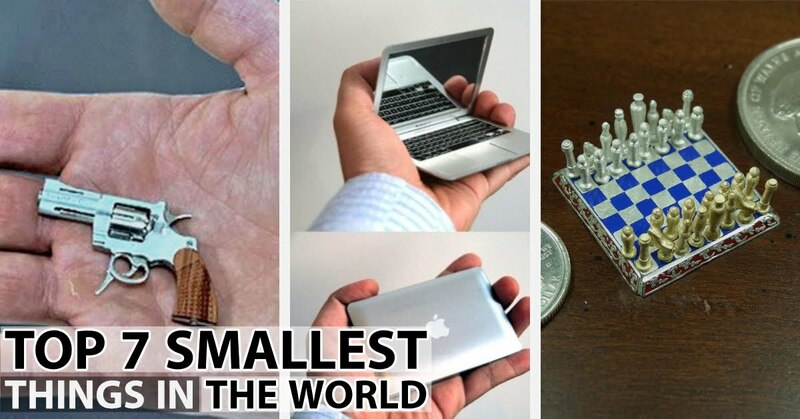 Read on to find out about the first five of the 7 smallest things in the world. Size can expand from beyond microscopic to encompassing the entire universe and everything in between. What may be large to some organisms may seem small to others. According to Guinness World Records, the title of the smallest working revolver in the world goes to the Miniature Revolver C1ST, manufactured by SwissMiniGun [source: Daily Mail]. 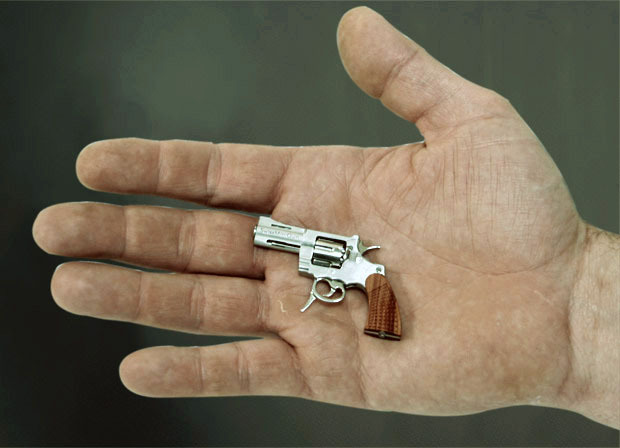 The tiny firearm measures just more than 2 inches and weighs less than 1 ounce. It fires bullets made by SwissMiniGun that are 2.34 mm caliber, rim fire cartridges and come as either blank rounds (which don't produce a bullet) or live rounds (bulleted) [source: SwissMiniGun]. Making the parts and assembling the gun requires the skill of a master craftsman, all of which are trained at jewelry and Swiss watchmaking. Thus about only 100 are handmade each year, with each order customized to the client's specifications, including the option for a special model made of 18k gold. Adding the double-action .09 caliber six-shooter to your collection will run you at least $6,705. "We are producing in very small quantities – perhaps 25 gold guns and 100 steel guns a year, and there is a six month waiting list to get one," SwissMiniGuns owner Paul Erard told the Daily Mail. "We will make whatever the customer wishes for. The most expensive version we have sold cost £30,000 and was covered in diamonds and came with a gold chain." Suffering from dyslexia and other learning disabilities, Willard Wigan never excelled in school but found solace in creating miniscule artwork that could barely be seen by the naked eye. Working under a microscope to capture the desired details, some of his materials include pieces of matchstick, nylon tags, and grains of rice. The final product can typically fit into the eye of a needle. Cheryl Moss from South Africa constructed the world’s smallest teddy bear in 2006. Named Tiny Ted, this bear measures at 4.5mm and can fit within a human fingernail. You can visit him in the Teddy Bear Museum in South Korea. 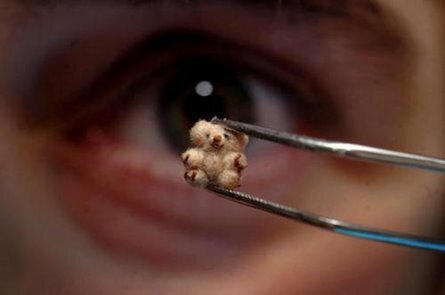 The smallest teddy bear of the world measures 4.5 mm. The bear is sewn exactly like a bigger bear and is fully jointed with a movable head, arms and legs. So are the second and third smallest teddy bears. The teddy bears are officially recognized by ‘Guinness World Records’. Police Station is often thought as a building containing many departments each having its own purpose for deterrence of criminal activities and irregulations in law and order. In the mid 1960’s, Carrabelle’s police station was situated in a call box that was rushed to a working at the side of U.S. Parkway 98 and Tallahassee Street. Amid this time, the city had issues with individuals making unapproved calls to its police telephone. Johnnie Mirabella, the main St. Joe Telephone Company worker in Carrabelle at the time, moved the telephone to another area, yet the illicit calls proceeded. In mid 1970s “Bede Aircraft Corporation” a small company owned by Jim Bede a US plane designer. Jim designed and manufactured a small kit for aircraft. The Kit was just weighing around 350 pounds and he managed to sold over 5,000 units. Out of five thousands unit only few of them were completed as the company got bankrupt and disconnects the supply. The BD-5J consist on 20 ft wingspan and can fly at a speed of 483 kph. The maximum crushing altitude is 7,010 meters. This type of jet planes were popular back than in 1980. This plane was and remain smallest power jet in the world. Crafted by a 73-year-old Chinese master potter, Wu Ruishen, this teapot continues to fascinate the world for its miniature size. Thinking it’s one of those teapots that are really used for holding and pouring tea? No, definitely it’s just a showpiece but how was such a miniature artifact crafted with so much finishing is definitely astonishing. This weighs just 1.4 grams (0.05 ounces). It is made up of clay and has a Chinese style manufacture being so small that you can hold it on your finger tip or even on the nail of your finger! Researcher of Fraunhofer Institute in Germany has developed a unique and tiny camera. The size of the camera is no longer than a grain of salt. This “Microcamera” invention is considered a revolution in medical history as it can take images inside a human body. Endoscopy has gone through amazing advancements in recent years. Microcameras on the tip of endoscopes supply images from the inside of the human body in ever higher resolution, which often makes it possible to identify tumors at an early stage. Endoscopes to date have some downsides, since they are expensive and, because of their multiple usages, have to be put through time-consuming and exhaustive cleaning procedures every time they are used. This problem might be solved by a new microcamera that the Fraunhofer Institute for Reliability and Microintegration (IZM) in Berlin, Germany has developed together with Awaiba GmbH and with the support of the Fraunhofer Institute for Applied Optics and Precision Engineering IOF in Jena, Germany. Martin Wilke, a scientist at the Fraunhofer Institute for Reliability and Microintegration, says "we can produce microcameras so inexpensively with our technology that doctors can dispose of endoscopes after using them only once." This is made possible by a new type of manufacturing process.